One way to live a life of confidence is by seeking to maintain a clear conscience. There is nothing that makes you stand straighter and look someone right in the eyes than when you know you have done things the right way. Great Grandma used to say that you can’t stop people from saying things about you, but you can live in such a way that no one will believe they are true. The Apostle Paul experienced much persecution as he went from place to place sharing the gospel story of forgiveness in Christ. He was beaten, ridiculed, thrown in prison, and even left for dead. This was not an easy way to live life, but even in the midst of all the opposition, Paul was able to maintain confidence in himself and his testimony. It was because he worked hard to live his life with a perfectly good conscience before God and men. This is not usually the case today. Too often when someone becomes famous or runs for public office the media or his opponents can find some “dirt” that will put him or her to shame. This is usually because he has not chosen to live a life of consistent integrity before God and men. Eventually his sins come out into the open and ruin his reputation. Though there were many times that Paul was accused falsely and put on trial, he was able to defend himself with the help of the Holy Spirit by telling the truth about what he believed and how he lived. The sketchy witnesses who were constantly speaking lies about him were not able to prove any of their accusations no matter how hard they tried. Even the high officials who were listening to the allegations could not find any real reason to prosecute him. Paul spent many months and years in prison, but not for any crime that he had done. His chains were allowed by God to further the spread of the gospel. As he suffered patiently he was able to continue sharing his testimony with a confidence only brought about by maintaining strong standards. If you want to live a life of confidence no matter what others say, then adopt Paul’s motto. 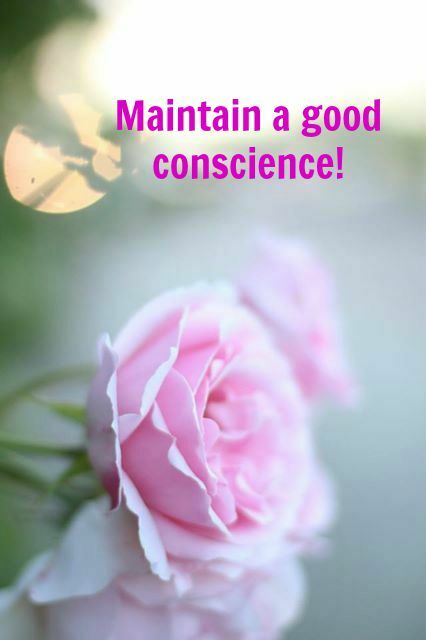 Do your best to always maintain a blameless conscience before God and men. Remember, you can’t stop people from saying things about you, but you can live in such a way that no one will believe them.